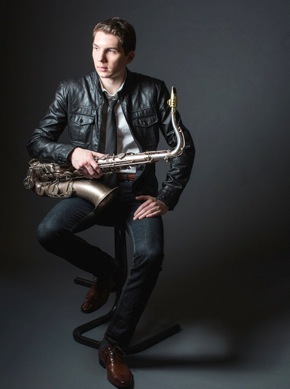 Thirty-five-time internationally award-winning jazz saxophonist and four-time Leo-Nominated film composer Eli Bennett has performed twice at the Grammy Awards in Los Angeles and shared the stage with the likes of Oscar Peterson, Hank Jones, Barry Harris, Terence Blanchard, and Dave Holland. He is a two-time-recipient of the CBC Galaxie Rising Star Award from the National Jazz Awards and the Ottawa International Jazz Festival, was awarded the Vancouver Mayor's Arts Award for music in 2012, is a D'Addario Woodwinds Artist and a Yamaha Young Performing Artist, and in 2013 was awarded the Queen Elizabeth II Diamond Jubilee Medal from the Premier of BC. Actively performing in Vancouver and Toronto since 2007, Eli has not only frequented jazz clubs such as Cory Weed's Cellar Jazz Club and The Rex Hotel as a leader and sideman, but was also recently featured on an episode of the popular Science Channel TV show Through the Wormhole with Morgan Freeman. In addition to performing at the Vancouver, Toronto, Ottawa, All-Canadian, and Prince Edward County jazz festivals, he has also performed regularly for dignitaries at the Queen's Park Ontario Legislature, the Netherlands Consulate in Toronto for Queen Beatrix's official birthday celebration, and the Ontario Premier's Awards. Other notable awards include the Jazz.FM91/Mary Elizabeth Stuart Award (Toronto International Jazz Festival), the Fred Sherratt Award (MusiCounts/CARAS), two DownBeat Awards for jazz composition, and the Oscar Peterson Grant for Jazz Performance from the Hnatyshyn Foundation. TV and radio appearances include Canada AM, ET Canada, CTV BC, CBC Radio's Hot Air, JazzFM91, and articles in The Province, The Georgia Straight, and DownBeat Magazine. As a film composer with over thirty credits, his scores have premiered at the world's most prestigious film festivals, including Festival de Cannes and the Toronto International Film Festival. In 2012, he earned a Leo-Nomination for additional music in the film Nash - The Documentary (Alliance), and in 2013 received two Leo-nominations for his work on short films Reset and Escape Act. Recently, he was the co-composer for Take Back Your Power, which won the 2014 Leo Award for "Best Documentary". Bennett’s debut album, "Breakthrough", was released in late 2014, and has since received extensive international attention, ranking in the top ten on the Canadian and U.S. Jazz Charts, while being featured on the homepage of iTunes Canada Jazz for two months as one of the top Canadian jazz albums of 2014. 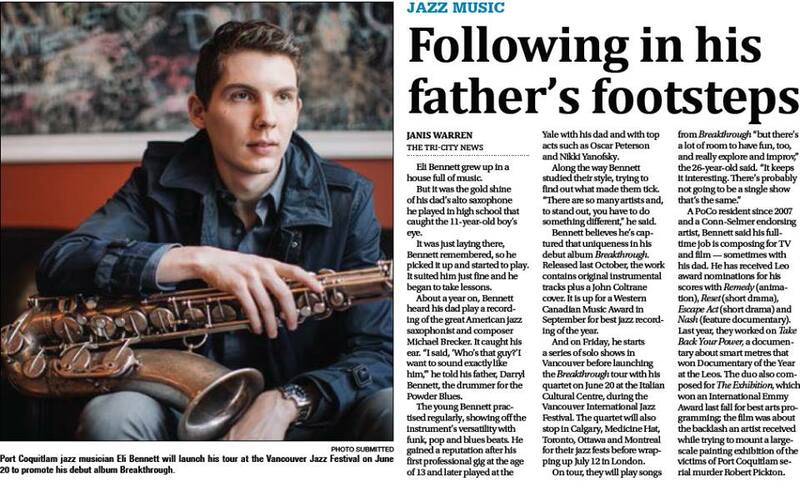 In addition to major international radio play in North America, Europe, Asia and Australia, the Ottawa Citizen namedBreakthrough the "#4 Best Jazz Debut Album" of 2014, while All About Jazz, Earshot Magazine and Wholenote Magazine echoed similar critical acclaim for the debut. In early 2015, Breakthrough won the Julian Jazz Award for ‘Best Canadian Jazz Album by an Emerging Artist’, as well as a nomination for ‘Jazz Recording of the Year’ at the 2015 Western Canadian Music Awards. "One of the most high-profile saxophonists in the younger generation of Canadian Jazz;"
"If the number of album sales after the show are any indication, [Eli Bennett’s] quartet’s tight, exciting performance helped gain them many new followers in Ottawa…"
"…the Vancouver–based tenor saxophonist delivers a program that gives pause to admire his writing and fluid improvisational skills." "He sears and soars, but the source of his power comes from soul, not bluster and brawn." "Mr. Bennett ‘speaks’ in an accessible tonal style, with a knack for simple beauty backed by colourful, flexible, open and populist musical arsenal punctuated with occasional outbursts of musical fireworks that reside somewhere between Sonny Rollins and Chris Potter." 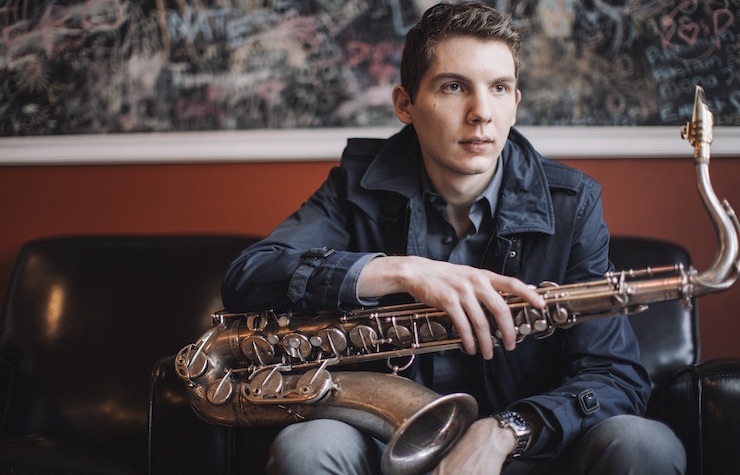 "Eli Bennett is the sax man who’s blowing into the night, holding his sax up high and running through some fast-faster-fastest fills that make the moment one to remember." "Bennett has garnered industry and fan attention for Breakthrough." Eli Bennett is also available for music composition work and music licensing projects.